Susan Smith Blakely’s groundbreaking books have the potential to change the lives of women and men in the law and support the legal profession as it reinvents itself for the 21st Century. Realism, empathy, and honesty—not blame—drive the Best Friends at the Bar project. Ms. Blakely is dedicated to improving the retention rates for women in the law and changing the way lawyers define success and achieve satisfying work-life balance. Best Friends at the Bar: What Women Need to Know about a Career in the Law is a marvelous book, and Susan Blakely is a gifted and vibrant role model for law students! 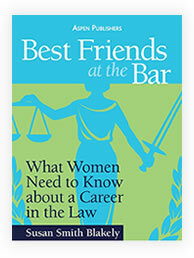 Best Friends at the Bar: What Women Need to Know about a Career in the Law sets the bar high with an easy, practical format. This is a timely, insightful read, replete with sound and practical advice for every law student, associate and partner. Best Friends is a must-read for the managing partner, recruiting chair and diversity committee leader of every major law firm in the country. 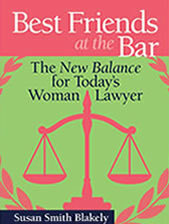 With Best Friends at the Bar: What Women Need to Know about a Career in the Law, Susan Blakely makes a huge contribution to our profession. Her thoughtful presentation and her thorough research will help young women lawyers understand more about their chosen profession and have the tools to craft successful careers. I am delighted to be a part of this book, and I encourage all young women attorneys and aspiring young women attorneys to read it. As an experienced lawyer, this is the kind of book I have been waiting for all of my career. “Best Friends at the Bar” is wonderful combination of helpful advice, insights from practictioners, judges, law school deans and others as well as a framework upon which a reader can make choices about her/his future in the law. Because the author spent much time polling those in the legal profession, the advice comes from many points of view including the male perspective. All of it is interwoven seemlessly so the reader is taken through many topics without much effort. It is a must read for anyone considering a career in law but it would also prove useful to those in recruitment at law firms to understand the challenges that still face women in the law. I am happy to recommend this book to all young women lawyers. As a litigator, especially, I understand the challenges that women face in this profession, and I know the importance of addressing these issues. Law firms and other legal employers are losing far too much excellent talent every year as women opt out of the law, and this book has the potential to open up the dialogue and improve that situation. My compliments to Susan Blakely for a book which captivates the essence of the problems of women lawyers in yesterday’s, today’s and tomorrow’s environment!! I was particularly impressed with the information in Chapter 4 and the appealing writing style and thoughtful manner in which she presented the problems, potential solutions, career choices, and a practical approach to career planning and choices for women lawyers and young lawyers just starting out in practice. I believe that this book should be “required” reading for every law student in the country–but also for every managing partner in every law firm in the country. This book should be a fundamental “change entity” if read and practiced by men! Thank you to Susan Blakely for producing this book. Best Friends at the Bar: What Women Need to Know about a Career in the Law more than compliments my own efforts with the Opt-In Project that I initiated at Heller Ehrman years ago and continue today at Orrick, Herrington & Sutcliffe. The mission of the Opt-in Project is to tap into the wisdom of industry leaders to find innovative strategies for the retention of professional women in the workforce. With this handbook of sorts, Susan Blakely is helping to bring us one step closer to our objective. 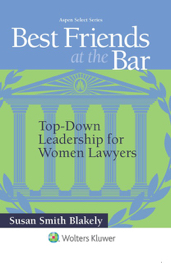 There is a great need in law schools and the legal profession for a book like Best Friends at the Bar: What Women Need to Know about a Career in the Law. I’m very pleased that Susan Blakely has written this book and commend her for taking on this project. The Best Friends at the Bar books continue to receive attention and praise in the press. Read more about what the press and Susan’s colleagues in the legal profession have to say about these groundbreaking books. Susan is continually collaborating on projects to advance women in the law. Read about some of these project below. All books are available for purchase on this web site and through Amazon Books. 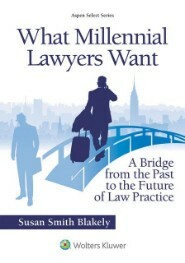 Book Review: Above The Law: Review in Two Parts of “What Millennial Lawyers Want: A Bridge from the Past to the Future of Law Practice;” https://abovethelaw.com/2018/11/what-in-the-world-can-be-done-about-millennial-lawyers/, November 29, 2018 and https://abovethelaw.com/2018/12/millennial-lawyers-what-you-need-to-know-to-succeed/, December 13, 2018. Litig8or – Advice for Women Lawyers: blog.litigatortechnology.com/…/best-friends-at-the-bar-an-interview-with-author-susa.. The Best Friends at the Bar Newsletter is published by subscription only. To be added to the mailing list, please e-mail [email protected] or subscribe through the website. The newsletter updates readers on issues affecting lawyers and law firm leadership and includes articles from guest contributors. Past issues of newsletters are available by contacting the author. Georgetown Law, “Alumni Events,” Fall/Winter 2015 reports Susan Smith Blakely as moderator of a panel at the Georgetown Law Women’s Forum 2015. Girl’s Guide to Law School article by Susan Smith Blakely: http://thegirlsguidetolawschool.com/08/time-law-firm-leadership-lean. Georgetown Law, “Alumni in the News,” October 2015, “Don’t Squander Female Lawyers’ Talent. Susan Smith Blakely Shows You How,” featuring Legal Bisnow coverage of the Best Friends at the Bar book launch event in DC on October 26, 2015. Wake Forest Law News features remarks by Susan Smith Blakely on the importance of law students pacing themselves in approaching their careers, from remarks delivered at Wake Forest Law in October 2014. Susan Smith Blakely coaches women lawyers and is a member of the Brain Trust for the OnRamp Fellowship. Above The Law quotes Susan Blakely on appropriate behavior for women lawyers in the workplace. “Women In Law,” Legal Bisnow, December 14, 2009.